On 25 April, and earthquake with a moment magnitude of 7.8 or 8.1Ms. Its epicenter was approximately 34 km (21 mi) east-southeast of Lamjung, Nepal. As of 30 April, it's taken the lives of over 6000 people. It was the most powerful disaster to strike Nepal since the 1934 Nepal–Bihar earthquake. Little more than two weeks after Nepal’s worst earthquake in more than 80 years, the country was traumatized by a second deadly earthquake on May 12. 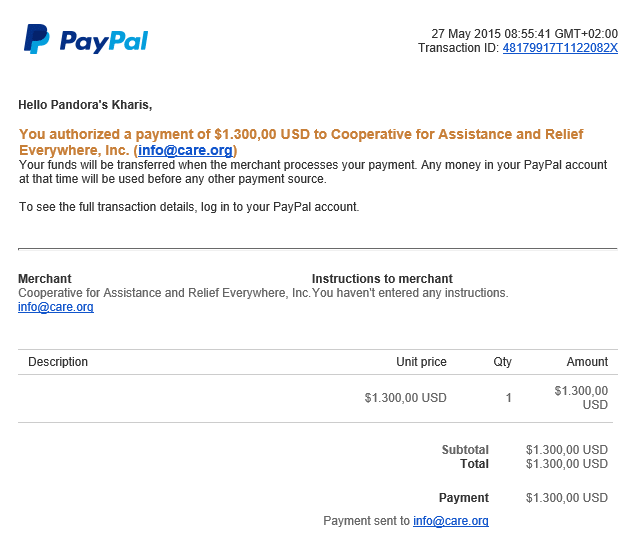 In order to help the survivors of this horrible tragedy, the members of Pandora's Kharis selected CARE as Mounukhion 2015 cause, and you have stepped up en mass. 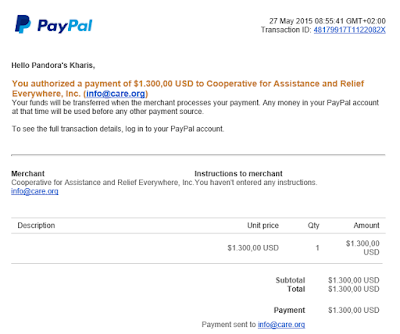 You have collected $1300,- to donate, and it fills us with pride to make that announcement. According to the Government of Nepal, over 130,000 homes were destroyed and more than 85,000 partially damaged. In some villages in remote areas, over 90 percent of the houses have been destroyed or damaged. With monsoon season less than month away, it’s a race against time to get emergency shelter to people. Over the next month, CARE plans to reach 30,000 people with emergency shelter kits that include weather-resistant tarps, rope and a toolkit that will help protect them from the rains as they begin to rebuild their homes. As people more towards recovery, CARE will provide the support to help people make changes to the way they build, so their homes are safer and more resilient when the next earthquake strikes. In some cases, CARE will provide livelihood support or cash vouchers to help accelerate their own rebuilding process. Your donation will help them reach these goals. From this moment on, the Pandora's Kharis Facebook page is open to pitches. If you do not have Facebook, feel free to pitch your cause in the comments. We will relay the message to the community. On to another month of pitching, voting, and giving. Thank you for your generosity, especially with this cause where lives are at stake.